The man who would come to be known as Man-E-Faces wandered the land of Eternia, taking advantage of those smaller than himself by using his face-changing ability to dominate them. After an encounter with Skeletor, however, he realized his own inner potential for good. Given the moniker "Man-E-Faces" by Orko, the once troubled individual went on to become Eternia's greatest actor. 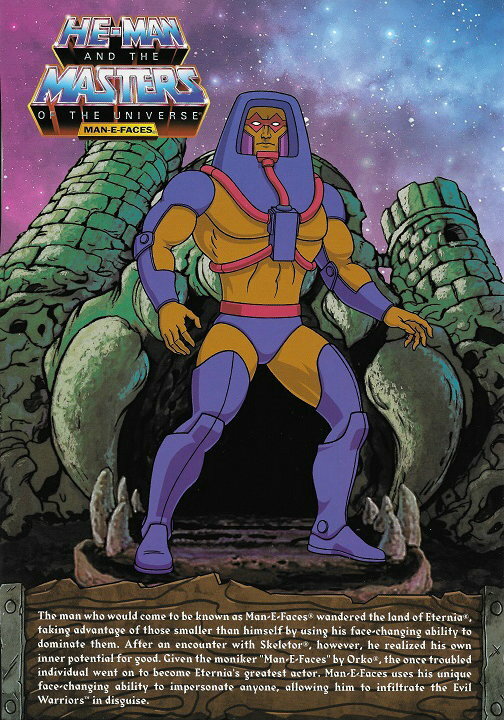 Man-E-Faces uses his unique face-changing ability to impersonate anyone, allowing him to infiltrate the Evil Warriors in disguise.